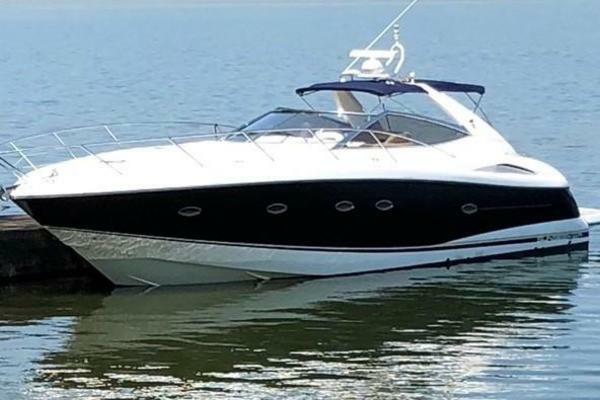 54' Sea Ray 540 Sundancer SEA DUCED PRICED TO SELL!CAPTAIN MAINTAINED, CRUISE READY!Servicing Completed July 2018:Fully Completed Bottom JobFull Annual Engine/Pod Servicing including new batteriesCompound & Wax DetailingZeus Drives with skyhookHydraulic swim platform liftFull teak cockpit with flat-screen and outdoor grillSat TVSalon wood floorOpen check book ownersKept undercoverSea Ray made sure the 54' Sea Ray Sundancer is smartly styled in a modern manner, with elegant flowing lines and plenty of window glass. Access to the vessel is via an integrated swim step, complete with a concealed stainless steel swim ladder, perfectly positioned so that it’s a safe, easy step from most docks.The helm station is a couple of steps up and fully open aft. This means there is easy access to, and superb visibility from, the double helm seats. The 540 has redefined what the aft end of a large express yacht should look like for boating families that enjoy watersports or just want to relax.The swim step and cockpit soles are nonskid teak that looks great and provides sure footing.A fiberglass hardtop, with a retractable sunroof and overhead lighting, protects the helm station. The overhead lighting comes with an electronic dimming system, to set the mood when appropriate. In the cockpit is a wet bar with a sink, a faucet and solid countertops, plus an excellent sound system with a satellite radio and an antenna. A well-finished wood table allows for plenty of dining space in the cockpit or provides a suitable setup for a buffet-style meal.The cockpit is also equipped with an aft sunpad and a comfortable lounge starboard of the helm chairs. To ensure plenty of sun-worshiping space, the foredeck comes with a standard sunpad, the base of which can be adjusted to a sitting position. It also includes built-in rails and drink holders. United Yacht Sales New Jersey would love to guide you through a personal showing of this 54' Sea Ray 540 Sundancer 2010. This yacht for sale is located in Fort Lauderdale, Florida and priced at $548,000. For a showing please contact us by filling out the form on this page and we will get back to you shortly! The door to the vessel's interior is to port of the helm station. The galley and salon, which are open to each other, are flooded with natural light through overhead hatches and built-in hull windows. A stone galley countertop forward and along the port side is longer than similar countertops on larger vessels. It contains a stainless sink with a modern single-lever control and a pull-out spray faucet. The sink cutout is fully finished and drops flush into the sink, creating a solid, level, full-length counter, useful for preparing a large meal or laying out a buffet for 10.The galley has plenty of cupboard and drawer storage, and all the drawers are self-closing. There is an under-counter refrigerator and freezer and a microwave/convection oven, a two-burner stove, a power vent and plenty of storage.The salon entertainment system features a home-style theater sound system and a 32-inch flat-screen TV. There is an L-shaped sofa that converts to a berth. All interior flooring is wood.The master stateroom, aft and under the helm station, features a comfortable queen bed and a washer/dryer in a closet. The en suite head is complete with an electric toilet, a separate shower stall and a vanity. There’s plenty of storage, a cedar-lined locker and a power vent. The stateroom is also well set up with robe hooks, dedicated toiletry shelves and grabrails.The forward stateroom is home to an island queen bed, a good sound system, an LCD flat-screen TV, a cedar-lined hanging locker and plenty of storage. The head contains an electric toilet, a separate shower stall and a medicine cabinet.Overall, the interior of this 540 Sea Ray Sundancer SEA DUCED is well thought out, modern in style and color, and contains first-class equipment and fittings. It has excellent creature comforts and the convenient touches one would expect in an express style vessel. The 540 is powered by twin Cummins MerCruiser QSC 8.3 L 600 diesels - spinning Zeus pod drives. Engines come up quickly and easily from a cold start, with no smoke or rattle. The vessel can move away from the dock easily with the help of the joystick control.The vessel is not equipped with either a bow or stern thruster, but the computer-controlled pod drives with joy-stick control make them unnecessary. The vessel's control is precise in all maneuvering situations. Vessel will idle about 700 rpm, and throws no discernible wake. The low-wake feature is useful when navigating in waters with speed restrictions.Where the 540 really shines in its handling. The solid glass hull has a 21-degree deadrise at the transom. The original Ray Hunt deep-V had a 22-degree deadrise, so the new 540 is, for all intents and purposes, a deep-V. Due to that configuration, the vessel will handle rough water with ease. The 540 handles sharp turns very well. It handles more like a small sportboat than a larger express, responding smartly to all command inputs. Part of the reason for that is the excellent match between engine and drive. This 540 Sea Ray Sundancer SEA DUCED is an excellent boat. It is well finished and has a well-matched hull and drive-train. It is fast and highly maneuverable, and it handles rough water better than most other vessels of its size and configuration. There is plenty of naturally lit space inside, and storage is not lacking. All surfaces are easy to clean, and there is good ventilation. If you are a boater looking for a fast, well-behaved vessel capable of rough-water operation when required, yet designed and built with a family in mind then SEA DUCED is a must-see!